Barbarah was brought to the orphanage with her cousin Elijah Tetteh. They are both from Kasoa and when they were discovered they were living with their grandmother as Barbarah's father was unemployed and could not take care of her. At the time, the grandmother was also taking care of three other children; Christiana, David and Rachael, who, eventually, all came to the orphanage at different times and are currently all still living here. 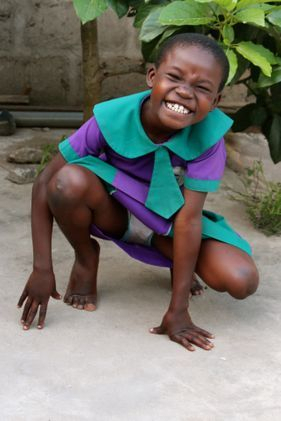 When Barbarah was first brought to the orphanage she was covered in open sores and rashes from head to toe. Patrick sent her straight to the hospital where she spent three days receiving treatment. To this day you can still see visible scars on her body. But now, she can enjoy all the pleasures of a playful childhood and thrives in school. She loves learning English and Mathematics and says she wants to be a teacher when she gets older. That could just be because her favourite thing to eat is a nice, juicy apple.